1. Precise digital counter for cut depth setting. 2.Auto head-elevation after complete a cut. 3.Power-driven blade cleaning brush and coolant cleaning flush hose. 4.Idle wheel motion detector for blade jam/break shut-off. 5.Carbide guides with hydraulic control. 6.Hydraulic quick acting vise jaw for stock clamping. 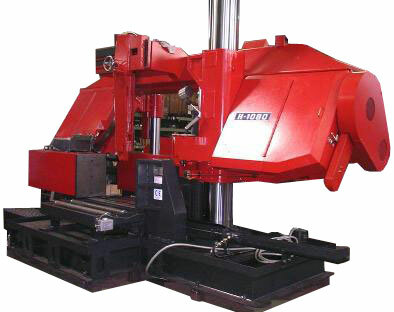 7.Hydraulic shuttle vise for stock feeding. 8.Motor and chain drve roller table. 4.Amplifying valve for auto-adjusting cotting feed-rate.